Triangle Pump Components - Volumetric Efficiency | Triangle Pump Components Inc.
Are your pumps running at their maximum strength? To be sure your pumps are operating at optimal volume, it is important to evaluate their volumetric efficiency on a regular basis. 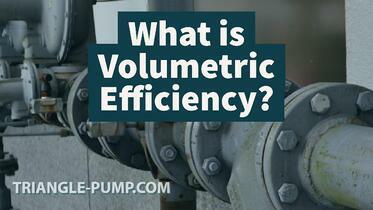 Volumetric efficiency is the actual amount of fluid flowing through a pump, rather than its theoretical maximum. Put another way, it is the measure of volumetric losses of a reciprocal pump through internal leakage and fluid compression; this calculation is the value that should be used to evaluate your current pumping mechanism. There are a number of factors that could be lowering your efficiency below optimal levels. What Causes Volumetric Efficiency Loss? Common causes of loss in volumetric efficiency include worn valves, seats, liners, piston rings, or plungers, pockets of air or vapor in the inlet line or trapped above the inlet manifold, or loose belts, valve covers, cylinder heads, or bolts in the pump inlet manifold. Routine maintenance and inspection in these areas can greatly increase output over time. Obstructions such as a safety relief valve partially held open or failing to maintain pressure, foreign objects preventing the pump inlet or discharge valve from closing or blocking liquid passage, or a vortex in the supply tank are some of the other more easily remedied factors reducing efficiency. How is Volumetric Efficiency Loss Corrected? There are many potential hazards that can hamper volumetric efficiency and cause your components to operate at less than full strength — but there are also a number of methods to increase it. Repairs, replacing parts with more optimal components, and enhancing system design will maximize efficiency and pay dividends in the future. Download our Suction Systems eBook to learn more and contact us with any questions or concerns.